Hang this messenger of love in the window, and sunbeams will brighten the room with its gem-like colors. 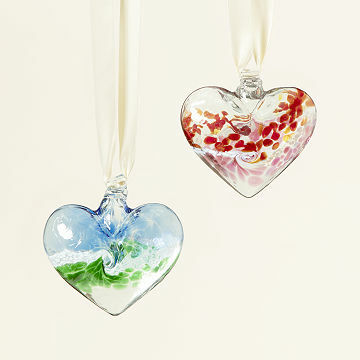 Hung from a window, the sun makes Stephen Kitras's hand-blown heart charm glow, the same way love does to real hearts. Swirling blue and green glass, like a miniature ocean, speak of the boundless love you feel. Sentimental? Absolutely. And in the unlikely case the message doesn't come across, its tag reads, "This gift is filled with love, it comes straight from my heart. From the moment that you hang it up, we will never feel apart." Handmade in Canada. 3.5" L x 3.5" W, 1.6 oz. This is beautiful and a perfect gift for a loved one. My wife was over the moon and loves it! She said this is beautiful and will be a lasting treasure. I have not seen it in person yet as she lives in another state but I am very happy that she loves it. My daughter found just the right place to enjoy the heart. It matched the colors in her apartment perfectly. She was very pleased with it! this gift was an affordable/special way to say "i love you", and was greatly appreciated by the recipient. Bought for my mother-in-law who is hard to shop for. Has the perfect sunny window for it. Nice little item to express our love for her. I'm very glad I bought this! This will look beautiful in a sunny window! Saw this and thought this was perfect for my best friend. She can use it in her kitchen window to remind her that she is loved. The colors are soft so it is not intrusive yet eye catching. This was a gift for my grandma. We don't live very close to each other anymore, and I wanted her to know I was thinking of her and sending love long-distance, especially as she goes through treatment for breast cancer. It's a beautiful glass ornament that catches the light and is the perfect size for hanging near a window. The only downside is it doesn't have a flat surface that makes it easy to hang directly on a window.